Let’s say you are an author whose debut novel is a monumental success. A movie based on the novel is made, which features an all-star cast, and is also a monumental success. If you are that author, what do you do next? You write a caper that takes place in a futuristic city on the moon, that’s what. 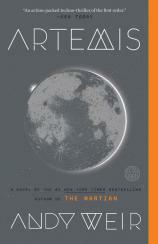 Enter ARTEMIS, the sophomore effort from Andy Weir. Like Weir’s first novel, THE MARTIAN, he uses his software engineering background and enthusiasm for space as a jumping-off point to write a future where living within Earth’s atmosphere is not always necessary. Artemis is the first, and only, city on the moon, a colony run by Kenya, which now controls all of Earth’s space travel. Jasmine “Jazz” Bashara was only six when she moved to Artemis with her father, a Saudi welder with a stellar reputation that means everything to him. Unfortunately for Jazz, growing up on the moon doesn’t preclude her from falling into the moody, parent-hating phase of being a teenager. When she’s 17, Jazz makes a decision that causes a nearly irreparable rift with her father. She gets a job as a porter, essentially a deliveryman, to earn enough money to live on her own. "If you enjoy science fiction and the technical aspects involved in futuristic space colonies on the moon, you’ll love ARTEMIS." But Jazz is exceptionally smart, which she tells the reader continuously throughout her narration and by those with whom she interacts, and has set up a side business smuggling contraband items to Artemis for the local elite. One of her best clients is Trond Landvik, a billionaire businessman who runs his enterprise from Artemis. He’s seeking a new venture, but first he needs Jazz to sabotage a rival company so he can secure the deal. Jazz is a criminal with a conscience and turns Trond down until he names his price, an amount of money that would allow her to pay off a debt and move into an apartment with room to stand up. It takes Jazz a mere day or two to come up with a complex plan to complete the sabotage, which involves her going on an extended Extra-Vehicular Activity walk, something she has trained for in her quest to become an EVA Master. But things don’t go as planned, and Jazz only narrowly escapes getting caught before she can finish the job. Things get worse when she finds Trond murdered and learns that the rival company, Sanchez Aluminum, is owned by a Brazilian crime syndicate who wants her dead as recompense for destroying Sanchez’s equipment. Jazz finds herself at the center of a dangerous crossroads and bands together with a ragtag gang of friends determined to keep Artemis and its residents safe. There are a few things in ARTEMIS that kept me from enjoying it like I expected I would. The first is Jazz herself. She doesn’t read like the twenty-something Saudi woman she’s supposed to be. Her voice seems inauthentic and, honestly, reads like an American male. I didn’t know Jazz was a woman until I was told as much several pages in. Artemis is truly an international city, but most of the characters, whether Saudi, Chinese, Norwegian or Ukrainian, are American in their dialogue, which causes the world in ARTEMIS to lose what little luster remains after the scant descriptions of what the interior city looks like. Those characters are also all snarky. Now, there’s nothing wrong with a little snark --- I prefer some snark to none --- but when it’s nearly every character, nearly all the time, it grows tiresome very quickly. Perhaps it’s a side effect of leaving Earth’s atmosphere? The heist element of the story is especially predictable. Plot twists and suspense were seemingly replaced by Jazz explaining the intricate science behind what she’s doing, telling us again about lunar gravity and the vacuum of space, or side character Svoboda continually asking Jazz if she’s had a chance to try out a self-cleaning condom he invented. If you’re looking for a thrilling caper with an unexpected ending and complex characters, this book may not satisfy. If you enjoy science fiction and the technical aspects involved in futuristic space colonies on the moon, you’ll love ARTEMIS.